Hello everyone, welcome. Today I am sharing the last part in my current D&D 5e Arc. In the last session, Rhyll’Zt was forced to endure a couple of trust/team building exercises with Nyssa Timbers, and the very last thing that happened was our Mine Cart plunging into darkness. What you have to ask yourself is, with death imminent, what happens next? And I suppose it all boils down to reason for playing and trusting that the Dungeon Master doesn’t see themselves as your opponent. Let us see if that trust was rewarded. Rhyll’Zt Zau’Und – Drow Ranger played by Me. Vuldin – Dwarven cleric played by Pete. Cassiea Ea – Tiefling Sorceress played by Simon. Torrin – Dragonborn Barbarian played by Alexander. Nissa Timbers – Gnome Rogue played by Sarah. Clatter – Kenko Rogue played by Amalie. . The next thing I knew was pain all over, and the taste of dirt in my mouth. The insufferable laughter was replaced by a voice. I felt something tugging at my hood. Hauled up, I could barely focus on the other party members who seemed to be no worse for wear. I was struggling to focus and dried blood was sealing part of my eye. I heard that interminable munching once again and I felt the pain leave my body to be replaced with only dull aches. I was able to stand and it appeared I was unharmed and definitely not dead. And that was that. Our enforced detour over we continued on the road to Ursadae. The others spoke of their challenges, which sounded like they were more like puzzles than insane deathtraps. I stayed quiet. This was new to me. I don’t really think I ever relied on anyone before or had anyone rely on me further than the letter of a contract. It is humbling to think the first time that happened we died as a result, and despite that the Gnome seemed to be handling it without recriminations. She was handling it better than I was. We arrived in Kharad Kal, the gate guards waving us into the walled port city. Vuldin accosted one of the guards to determine the best way to get to the Dwarven Stronghold, Kharad Kal, and was told that there were frequent caravans on the north road. We hurried to the caravanserai and were able to sign on with one leaving in the morning. There was no getting rid of him, and for reasons beyond comprehension, Nyssa decided to tag along on my solo errand too. I suppose I could have lost them in the city, I am certainly faster than both and better suited to that, but I suppose that would just mean he’d be watching me constantly. The dwarf needs to mind his business. We agreed to meet back at the Caravanserai later, as the others decided to do a bit of shopping. We found the Doctor’s residence after speaking to a guard and a beggar and found it locked up. There was a light on upstairs. “We should knock,” said Vuldin. He started knocking. There was no reply within a few minutes. “What’s going on here. Who is this?” I decided guild business could wait. My contract didn’t include random deaths and to be honest I didn’t really have the stomach for more death this day. Forgetting his customary nonsense, Vuldin hurried to the Doctor’s side and placed a hand on the wounded scout. The hand glowed slightly and I could see a wound, formerly gushing blood, was starting to close. The doctor thanked me. I took a clean towel and some warm water and helped the doctor keep wounds clean whilst he tried stitching. I actually believed him. Vuldin returned with the antidote which the Doctor administered. The patient’s breathing became stronger and the doctor’s frame slumped. He fell into a cot in the corner and was asleep within moments. We returned to the Caravanserai to relay the news about the north road. I tried to slip away to connect with the guild, but the Dwarf stopped me again. I stormed away and began threading my way through the city. He was still following me, but that didn’t matter, as I had a lead on him. My contact was a Halfling in a tavern on the docks. I found the place and made my way through a room full of thieves and muggers, all of whom were eyeing me with curiosity. The halfling was sipping wine from a glass. I fetched another pair of wine glasses and approached him, offering him one. He indicated I should sit. I heard shouting. And then I heard metal clanking. No, please no…Outside I found Vuldin brawling with a guard. The guard’s companion watched with no small amount of disdain. I sidled up to him. “Vuldin you were spying on a tavern, and the guards obviously have a job to do.” I was actually starting to enjoy this turn of events. Vuldin probably would have won against one guard, probably not the other watchmen who were approaching. Apparently they had sent word before engaging. Smarter than your average guards. Vuldin looked undaunted. I walked up to him and punched him in the gut, which turned out to be more painful to me than him as his gut was quite muscular. 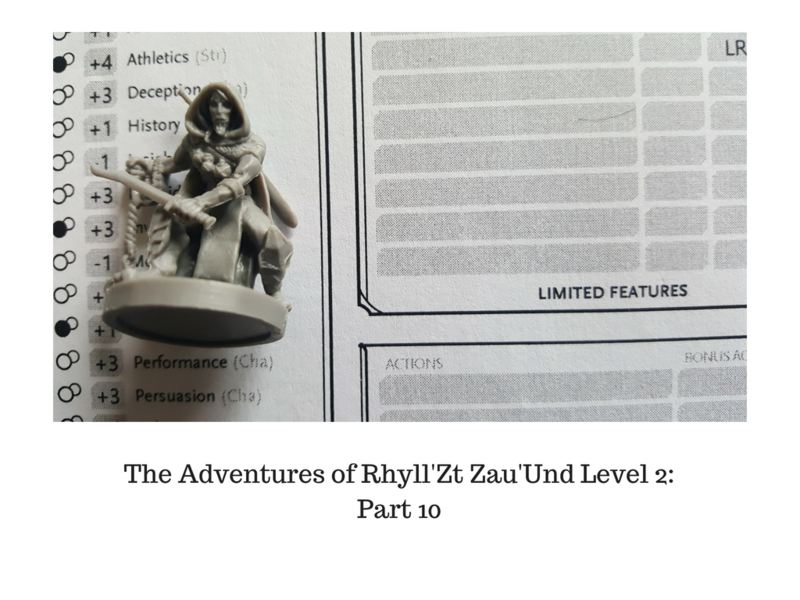 And here endeth Level 2 of Rhyll’Zt’s adventures with Vuldin and Co. I hope you have enjoyed and will keep an eye out for future installments. And in answer to the question at the start. Yes, my trust was rewarded. Fair enough. I say write notes it while it’s fresh.